In 2017, the global point of sale software market accounted for US$ 12.9 billion. This number is expected to reach US$ 30.9 billion by 2024, i.e. a CAGR of 13.3% between 2018 and 2024*. POS stands for “Point of sale”. A POS system is used to conduct sales at brick & mortar and eCommerce stores. Gone are those days when retailers used a cash register to process sales after which the data was transferred to accounts and stock list. Today, with the help of a retail POS software you can simplify your billing, promotions, returns and much more. The point of sale system can be integrated with your other systems and software such as eCommerce platforms, accounting apps, ERP and warehouse systems. A full-featured enterprise POS system can handle sales monitoring and reporting, analytics, inventory tracking, mobile connectivity, customer data management, employee management, and robust integrations. A Mobile POS system or mPOS uses an electronic device such as a smartphone, tablet, or another mobile device as a terminal at which you can attach a credit card reader. It is highly portable and allows you to attach other peripheral devices such as barcode scanners and receipt printers. mPOS systems are used to process payments and may have other capabilities such as inventory management, loyalty programs, sales monitoring, reporting and much more. These systems are best suited for small businesses and entrepreneurs, small retail stores, pop-up shops, and quick-serve establishments. mPOS systems don’t take up too much space and are highly affordable and convenient. A terminal POS is a software/hardware based system that carries add-on peripherals such as barcode scanners, credit card readers, receipt printers and cash drawers. These systems have extensive capabilities including inventory management, reporting and analytics, payment receipts via email, CRM and customer loyalty programs. They are best suited for retail stores that have cash dedicated cash wraps. Due to their advanced functionalities and reasonable prices, they are used in businesses such as restaurants, grocery stores, boutiques, book or magazine stores, salons, and electronic stores. A cloud POS is an online or web-based POS which can be easily used with your existing hardware such as a computer, tablet, and printer. These systems have all the functionalities of a terminal POS. The only difference is that, instead of being installed on a server that is run by you, a cloud POS system is installed in data centers that are maintained by the POS vendor. They are suitable for all types of businesses, especially startups because of their tangible benefits in cost, simplicity, flexibility, and function. The hardware of a POS system consists of the physical setup like cash register connected to a PC or server, or even a portable device such as a tablet or smartphone connected to a cloud-hosted system. It may contain add-ons such as barcode scanner, receipt printer, label printer, cash drawer, scale for weighted items and a card machine to process the payments via debit or credit card. The POS software stores the information and maintains it within a database. A feature-rich POS software provides a huge range of capabilities such as billing and order processing, sales monitoring and reporting, inventory tracking, returns, analytics, mobile connectivity, customer data management, employee management, and loyalty programs. Many POS software can be integrated to 3rd party software such as accounting software for bookkeeping, email marketing solutions, and ecommerce platforms for selling online. A point of sale system must have the basic functionality of billing and order processing. It should be able to bill orders by scanning items and capturing different payment modes. It has the capability to generate order invoice, reprint and email to end customer along with adding the discount, customer details, additional remarks and salesman’s name to an order. The point of sale system must be able to generate a robust report on sales result. It should be able to report hourly, daily, weekly, monthly and yearly takings and outgoings so that the merchants can easily understand the overall success of their business. Sales trends such as seasonal demand in products, forecast on the basis of sales trends, insights on unnecessary product overspend, and information relating to stock management are some of the features of an advanced POS reporting module. A POS system’s inventory management module must provide complete visibility and accountability at store level at all times. The system should provide a view of lot-wise inventory, SKU transaction history about ‘in’, ‘out’ and ‘within’ movements of any SKU, and inbound & outbound inventory. It should be able to make stock adjustments i.e. increase/decrease stock while viewing inventory and capture the reason for stock adjustments. Accepting cross-channel returns and facilitating refunds and replacements from any store location are some of the functionalities of a POS returns management module. The system should facilitate the creation of multiple returns for one sales order at different time intervals. It should capture details like the reason for return, salesperson’s name, and remarks. A point of sale system can help you retain your customers by storing customer data and purchase history. This can be used to provide a personalized experience to your customer. Customer data is highly useful for advertising as this data can provide insights on which customer would be interested in your sale. For example, sending a sale flyer for “30% off on oversized shirts” to the customer who wears a medium sized shirt would be a waste of time. It is surprising for many when we say that a POS system can be used to manage employees. But, an employee management module of a POS system can help you manage your staffing levels, employee hours, and sales performance which helps you to track employee productivity. You can track your employee activity by linking it with each transaction. This will help to bifurcate the good and weak performers so that you can take appropriate actions to improve their productivity. Instead of using traditional punch cards, you can now track your customer loyalty incentives using the POS system. As the sales of gift cards is increasing every year, your POS system must have the capability to manage those as well. Today’s POS system go beyond processing sales. As you have learned in the previous sections, a feature-rich POS can help increase efficiency and provide insights to help you improve your productivity. 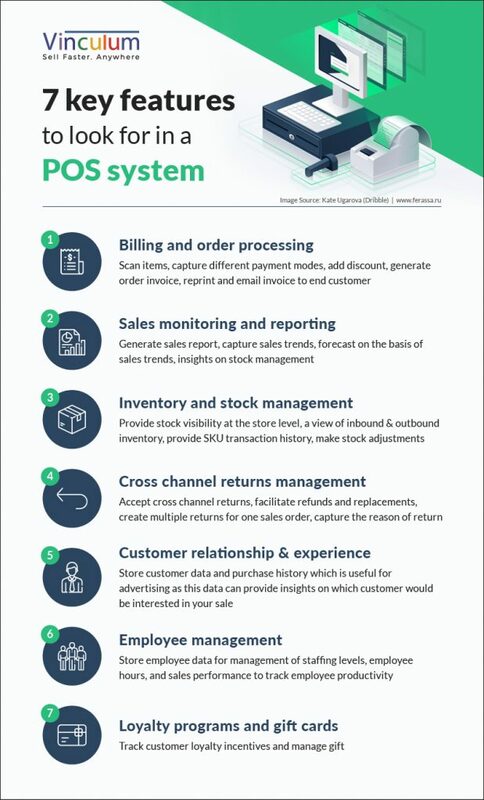 These are the reasons for you to switch to a POS system today. See how Vinculum can help you achieve that with a cloud-based Point of Sale system. As the retail industry gets more and more competitive, how can you differentiate yourself from the crowd? It is imperative that yo.. Going O2O is by no means an easy task. Here we break down what O2O means for you as a retailer. Read on - ..